Singapore is a hot and humid country. Heat and water are the mortal enemies of our expensive camera and lens equipment. Keeping them in sealed boxes with silicone gel can be helpful but what is highly recommended is investing in a dry box to protect your equipment. 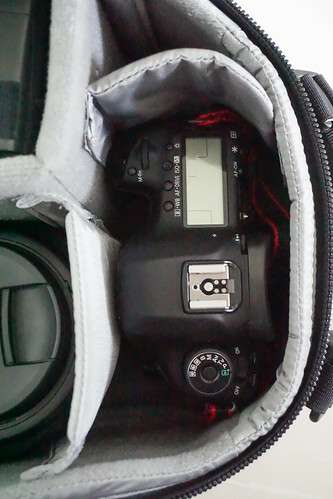 The humidity level in the dry cabinet should be around 40-50%, which is most optimal for photographic equipment. UV filter comes from the days of film but even in the digital age, these filters are still commonly found on lenses. One of the main advantages is that these filters protect the front elements by adding an extra layer from accidental dents and knocks. 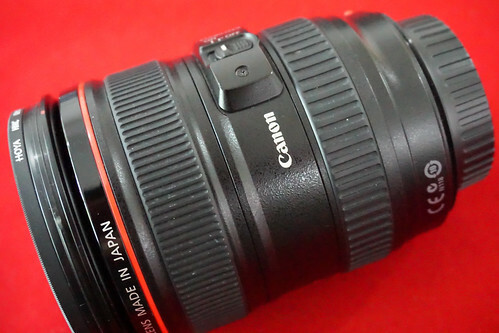 Also, the original screw thread on the front elements of the lens are protected by the filter’s thread itself. Once I accidentally dropped my EF24-105mm f/4L IS USM lens on a sandy beach but to my great relief, I discovered that only my UV filter had been scratched by the coarse sand and my front elements were spared entirely. I only needed to replace the UV filter and spare myself from expensive repairs and or even a replacement.The lens hood is used to block and divert stray light from entering the lens and spoiling an otherwise good photo. 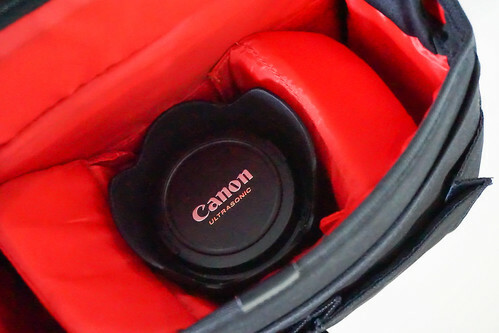 However, the hidden advantage of having a lens hood on during usage is that it extends the protection coverage provided by the UV filter mentioned earlier. 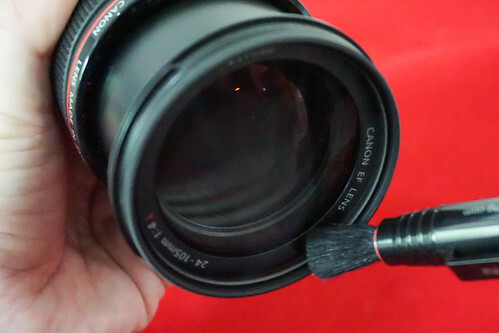 Cleaning the front and rear glass elements are important as these directly affect the quality of images captured. There are many standard and affordable tools that can be used to maintain these areas. 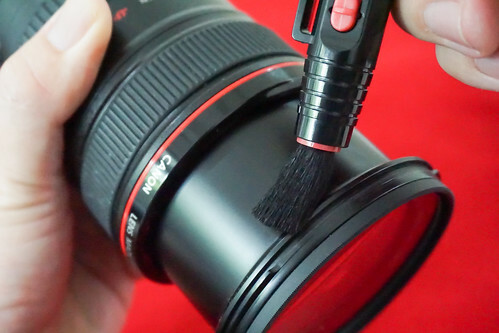 Air blower, lens pen (with carbon tip), micro fibre cloth and brush are useful tools. 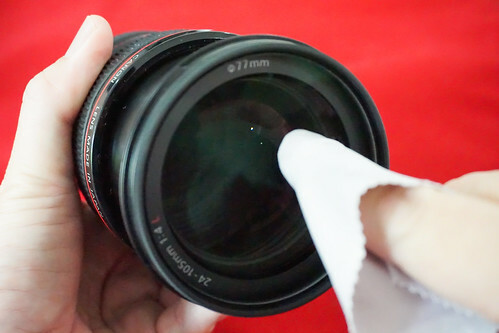 Avoid the habit of conveniently using T-shirts or tissue paper to clean your glass elements as they are not made specially to handle the delicate and expensive glasses.The following sequence of steps is a rough guide I normally follow. You may not necessarily follow them religiously. 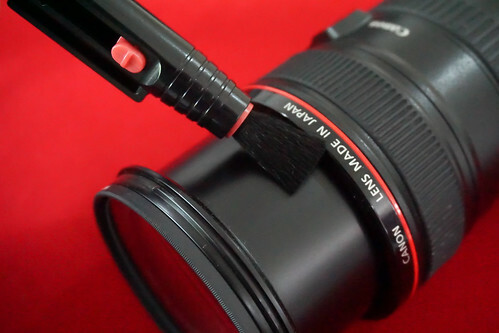 Step 4 – Use lens pen carbon tip (remember to twist the tip to the carbon deposit at the cap) to remove finger print marks etc. 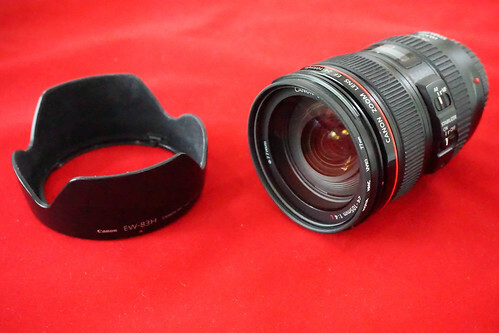 The front and rear elements are very sensitive glass elements on the lens, so having the lens cap on the lens when it is not in use is always a good habit. The rubber rings on the focus and zoom (if applicable) are one of the more fragile components on the lens. After repeated wear and exposure to heat over years, these rings can loosen and thus, affect the grip on focusing and zooming. 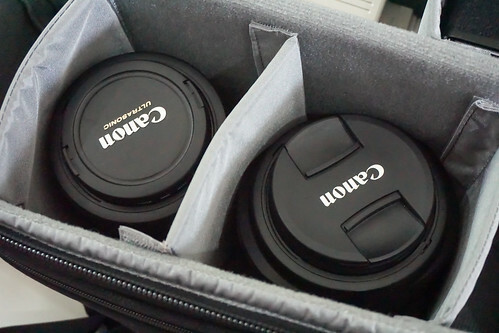 Keeping the lens stored in a cool area helps. 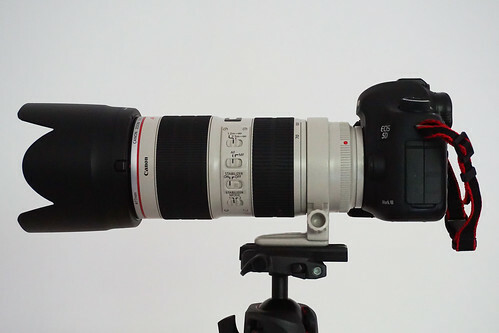 Heavier lens normally comes with a tripod mount attached. Use this mount when camera is on tripod; avoid overhanging the heavy lens with the tripod mount on the camera body itself. Doing so will strain the joint between the lens and camera badly over time. Use tripod mount rings provided for heavier lens when mounting on tripod to prevent straining on the lens and camera mount joint. For some lens with extendable zoom, dust particles may get trapped in the gaps between the fix and movable components over time. 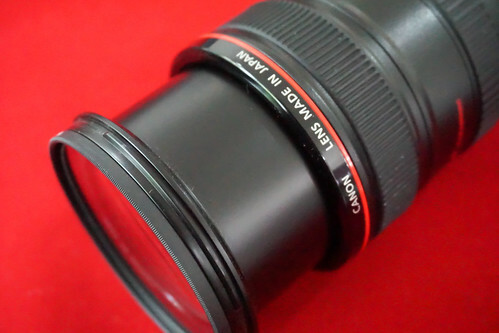 The contact points at the lens are critical to the connectivity and basic functionality of the lens itself. Hence, this is one of the important points to clean. Do not expose these metallic contact points to wet elements. 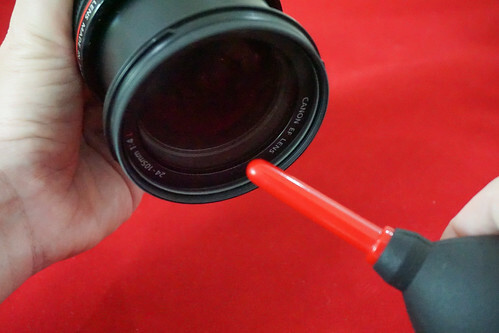 Keeping them dry and clean will prolong the life of the lens. 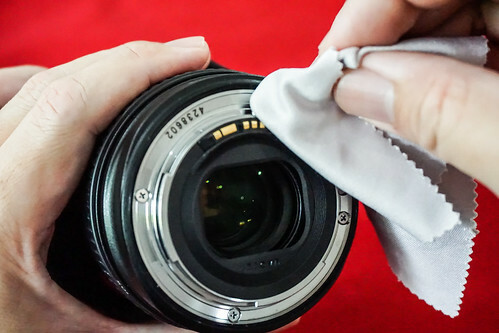 Clean the contact points on the lens with brush and micro fibre cloth – Attention: only DRY CLEANING! 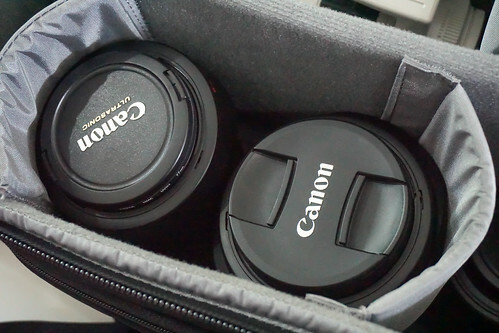 When carrying camera equipment and lenses, using a proper camera bag enhance the protection of lens itself. 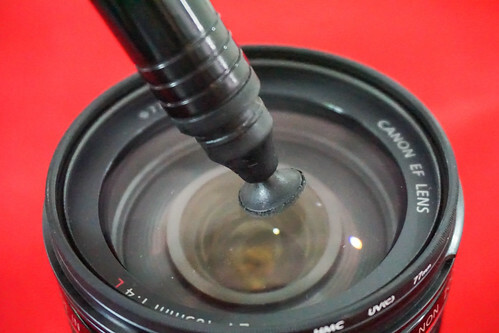 Using the soft cushion dividers to store the lens individually help to prevent knocks and scratches. 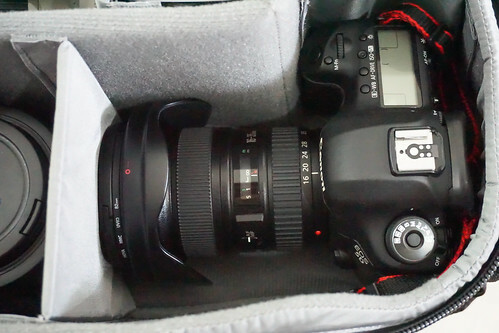 When travelling with camera equipment especially on flights, I do not leave any lens attached to the camera body itself. 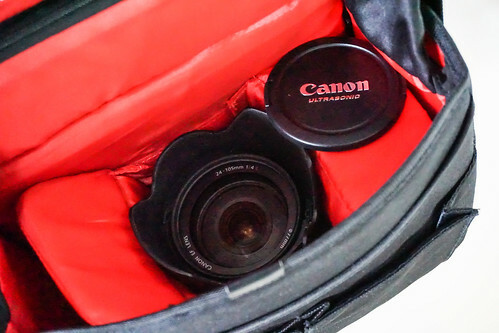 It is always a good habit to keep the camera body and lenses stored properly and safely covered with the cushion dividers provided in a camera bag. Sometimes when replacing a lens for a short moment, I tend to put the other unused lens into the bag without the front lens cap on as I intend to change back to this lens later after I have taken a few shots. This leaves the unused lens pretty much “exposed” to the elements. We are very guilty of doing this especially when trying to do a quick lens changing in the middle of taking photos – forgetting to switch off the camera when detaching the lens. 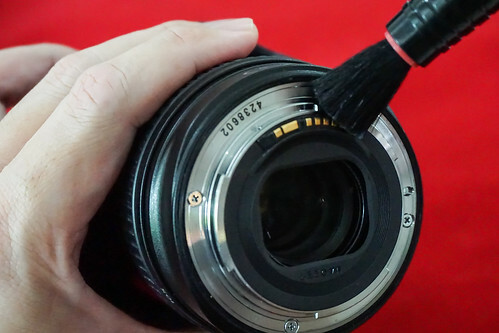 Doing so might not trigger any immediate malfunction to the camera and lens but making these mistakes commonly can degrade the performance and lifespan of the equipment. Sometimes when using smaller bags, I tend to overpack by squeezing in other accessories like remote controls, spare batteries, even my handphone, house keys into the same compartments with the lens. We can imagine how they will interact to one another when we moving with the equipment! 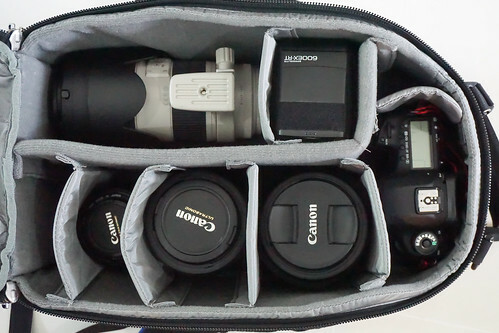 The general advice is to use a camera bag big enough to house your equipment comfortably!